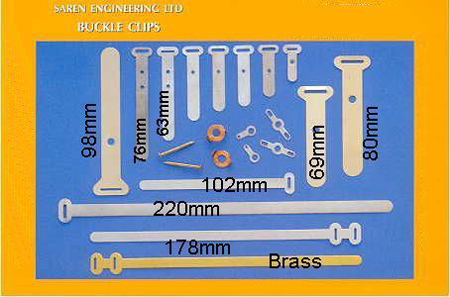 Saren Buckle Clips are ideal because being made of metal, they do not deteriorate (as plastic ties can do) in the ultra-violet light and heat of the sun. Saren's Nickel Silver Buckle Clips are particularly suitable for retaining escape route wiring in order to meet the requirements of amendment 3 of 17th edition of IET "the regs". Our Buckle Clips can be nail gunned or screwed within the plastic trunking and can easily be undone and re-clipped to take extra wires/cables. Recent orders also include shipments to Norway and Belgium.